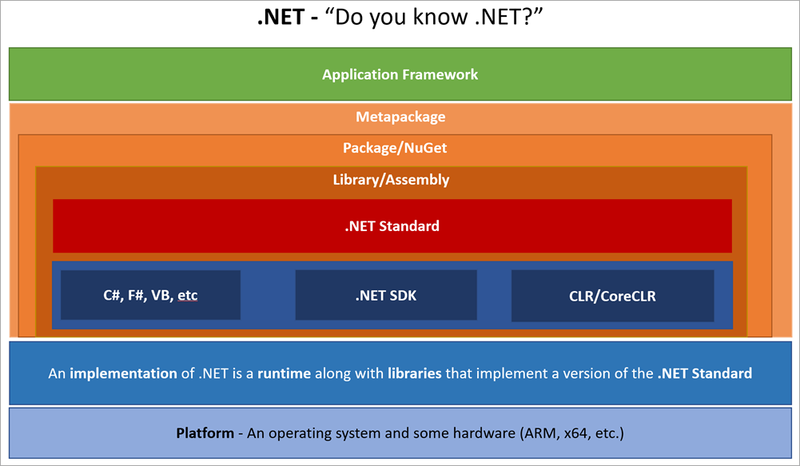 By now this should be out of [WayBack] Draft – .NET Glossary Diagram – Scott Hanselman: a list of common terms to describe various parts of the .NET ecosystem. He has a nice list of sentences where each term is used. I’ll try to use them myself as well, so I gave it a start at paulcbetts/refit: The automatic type-safe REST library for Xamarin and .NET. This is so cool: [WayBack] paulcbetts/refit: The automatic type-safe REST library for Xamarin and .NET. It’s inspired by Square’s [WayBack] Retrofit library which does the same for Java. They basically allow you to use attributes on interfaces to define a type-safe wrapper around any REST interface, then instantiate a connection to it for making calls. No more manual HttpClient fiddling! Since it requires only .NET 1.4, you can basically run it on any platform as it’s supported covered by the implementations .NET Core, Mono and the full .NET Framework. The list below is based on a G+ discussion in a single language, but has way broader aspects. It’s on value types, mutability, parameterless constructors and expectations of compiled code. I’ve bitten myself in the foot with mutable types in too many languages too often, so I started advocating this years ago at clients, and now in this blog-post. The “just pass them as reference” often seen as reason to explain “mutable value types are OK” is exactly describing why they are not OK.
A few things in there that I didn’t know yet (like pinning data tips, tracking out-of-scope variables with object-ID and debugger attachment): [WayBack] Tips and Tricks in the Visual Studio Debugger | Microsoft Docs.